San Beda College (Spanish: Colegio de San Beda) and (Filipino: Dalubhasaan ng San Beda) is a Private Roman Catholic Benedictine college run by the Benedictine monks in the Philippines. It is located in Mendiola, Manila, for college and Taytay, Rizal for Elementary and High School. It was founded in 1901 primarily to "defend the Catholic battlements in the field of education." San Beda, which was known then as El Colegio de San Beda, started as an all-boys grade school. It has since then expanded to a full college with both undergraduate and post-graduate degree offerings. It has two other campuses: the San Beda College-Rizal (the largest San Beda campus in size) and the San Beda College Alabang (formerly known as St. Benedict College and Benedictine Abbey School) located in Alabang Hills Village in Muntinlupa City. San Beda College Alabang however is autonomous from the other two San Beda campuses and has its own set of administrators and officials. The San Beda Graduate School of Liturgy in Manila, meanwhile, traces its academic roots and origins to the Paul VI Institute of Liturgy in Malaybalay City, Bukidnon. Located in a once quiet, middle-class residential area, San Beda College is now part of Manila's bustling University Belt, an irregular crescent curving for about six kilometers through six districts of Manila, containing more than thirty colleges and universities. San Beda College offers programs in the fields of accountancy, business, marketing, economics, and law. At present, the Benedictine College has seven departments: the Basic Education Department; the College of Arts and Sciences, which offers liberal arts, sciences, and business programs; the College of Law, founded in 1948; the Graduate Schools of Business, Liturgy and Law; the College of Medicine, and the College of Nursing. In 2003, the once all-male San Beda College finally opened its doors to female students and relocated its Basic Education Department (pre-school to high school) to a new and bigger campus in Taytay, Rizal. The school is a founding member of the Philippine Accrediting Association of Schools, Colleges and Universities (PAASCU) and the National Collegiate Athletic Association (NCAA), where it competes in sports such as basketball, football, swimming, taekwondo, and lawn tennis. The school has adopted for itself the moniker, "San Beda Red Lions." Its brother school, San Beda College Alabang is a member of sports leagues such as the WNCAA, NCAA South and the National Cheerleading Competition (NCC). San Beda College counts among its notable alumni the late Senator and hero Benigno Aquino, Jr., the late statesman and former senator Raul Roco, former speaker Ramon V. Mitra, human rights advocate and former senator Rene V. Saguisag, San Miguel Corporation chairman Ambassador Eduardo Cojuangco, Jr., corporate magnate and PLDT Chairman Dr. Manuel V. Pangilinan, Supreme Court Associate Justices Antonio Eduardo B. Nachura and Jose Catral Mendoza, and Justice Secretary Leila M. De Lima. In 2013, of the 50 Richest Filipinos ranked by Forbes Magazine, five were graduates and alumni of San Beda College, namely, Mr, Robert Coyiuto, Jr. (Rank No. 12); Mr. Andrew Gotianun (Rank No. 17), Ambassador Eduardo Cojuangco, Jr. (Rank No. 20), Ambassador Jose E.B. Antonio (Rank No. 32), and PLDT Chairman Manuel V. Pangilinan (Rank No. 50). The Rizal campus of San Beda College houses the basic education unit of the College. It is located in Taytay, Rizal. Although the Mendiola campus is the oldest, the first San Beda campus was originally located in Arlegui Street near the compounds of the MalacaÃ±ang Palace. The Benedictine College, however, decided to relocate not only the school but also the Order's monastery to Mendiola in order to accommodate an increasing student population. The Mendiola Campus formally opened in 1926. Due to the social and political unrest during the 1970s, the Benedictine monks initially entertained the thought of leaving Mendiola and of transferring to Alabang where they recently acquired property. However, the monastic fathers abandoned the idea and instead decided to stay in Mendiola and to build another campus in Alabang at the same time. At present, SBC-Manila houses four colleges: Arts and Sciences, Nursing, Medicine, and Law. The three graduate schools of San Beda namely, Business, Law, and Liturgy, are located in the Mendiola campus. 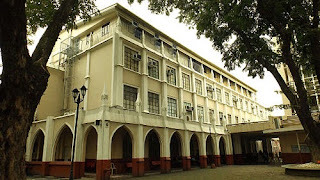 The College of Arts and Sciences is the oldest college or tertiary level department in San Beda College-Mendiola, Manila. More fondly called by its acronym, "CAS," the Arts and Sciences department has brought many awards and achievements to San Beda College. The CAS was instrumental in San Beda College's being granted the Level III accreditation and reaccreditation in 2001 and in 2003, respectively, by the PAASCU, as well as the autonomy status given by the Commission on Higher Education in 2003. The San Beda College of Nursing (CON) offers a Bachelor of Science in Nursing program. The CON began its operations 2003, in consortium with the Loyola Medical College Foundation chaired by Dr. Johnny Fong. The consortium with Loyola Foundation ended in 2008. At present, the CON is now solely run by San Beda. In June 2004, the San Beda College of Nursing building was inaugurated and named in honor of its patrons, Rose and Albert Fong. It has 12 rooms and two Skills Laboratories. The Skills Lab A serves as the lecture room for RLE activities while on the other hand, Skills Lab B was set up as a "mini hospital" which includes an operating room, nurses' station, private rooms, a delivery room and a nursery. This hospital set-up is equipped with state-of-the-art instruments that are commonly used in most hospitals in the country. In 2005, despite being one of the youngest nursing schools in the Philippines, the CON's first exam takers gained a record of 88% passing rate in the Philippine Nursing Licensure Exam, with one of them ranked 8th among all candidates nationwide. Since then, the College had a consistent record of maintaining a high passing rate in the two board exams that followed (The CON achieved 78% and 72% passing rates in 2006 and 2007, respectively). For this feat, the CON was cited by the Commission on Higher Education for a good performance and was declared as one of the Top Nursing Schools in Metro Manila in 2007. The College of Nursing is affiliated with University of Loyola in Northern Marianas Islands, United States Territory. It has many graduates practicing as registered nurses throughout the United States. The San Beda College of Nursing now ranks third in the Philippines in its category. In addition to the Nursing department, the San Beda College administration decided to put up another department to strengthen its health sciences program. The San Beda College of Medicine (CoM) was formally established on March 9, 2002, with the task of offering a four year course leading to the degree of Doctor of Medicine (M.D.). being its fifth unit. It has a faculty of over 70 medical lecturers, who come mostly from the University of the Philippines Manila. The College is located at St. Benedict's Hall. It uses several laboratories in St. Maur's Bldg. along with other colleges and have a dedicated cadaver room on the third floor for its anatomy classes. Clinical clerks (fourth year medical students) do their clinical rotations at Quirino Memorial Medical Center, East Avenue Memorial Center, Armed Forces of the Philippines Medical Center, Makati Medical Center, Philippine Children's Medical Center, Veterans Memorial Medical Center and Manila Doctor's Hospital. The CoM has sent examinees from its first batch of graduates from the school term 2002-2003 to the August 2007 medical board exams. Seventy-one percent of students passed. The College of Medicine is affiliated with the University of Loyola in Northern Marianas Islands, United States of America Territory. The San Beda College of Law (CoL) was founded in 1948 upon the initiative of former rector-president Fr. Sergio Martinez, OSB. Feliciano Jover Ledesma, an Ateneo graduate, was the first dean of the San Beda Law School. It sent bar candidates for the first time in 1952, who all passed the bar. From 1953 up to 1958, the San Beda Law School achieved a feat of attaining a 100 percent passing rate in the Bar Exams. It has also produced lawyers such as former Senator Rene Saguisag, the late Senator Raul S. Roco, Department of Justice (DOJ) Secretary Leila M. De Lima, Commission on Elections Chairman Sixto Brillantes Jr., and six Justices of the Supreme CourtÂ â" Florenz D. Regalado, the holder of the highest bar exam grade in the country, Justo P. Torres Jr., Antonio M. Martinez, Romeo J. Callejo Sr., and current Supreme Court Associate Justices Antonio Eduardo Nachura and Jose Catral Mendoza. In 2004, the San Beda College of Law, in partnership with the Supreme Court of the Philippines and the Philippine Judicial Academy, established the Graduate School of Law with post-graduate studies focused on criminal justice and the judicial system in the country. However last March 2008, the Graduate School of Law was formally renamed, "the San Beda Graduate School of Jurisprudence and Juridical Studies." Just recently, the San Beda College of Law garnered the highest passing bar exam rate in the 2007 Philippine Bar Exams at 93.27 percent. It also produced one Bedan bar topnotcher in the said year. Meanwhile, during the unveiling of the St. Benedict Shrine in the school's jubilee garden, Archbishop Edward Joseph Adams, the Vatican's Apostolic Nuncio to the Philippines, lauded the San Beda Law School's tradition of academic excellence and its rich Benedictine and Catholic heritage. He also praised the law school's aim to create not only competent lawyers but Christian Bedan lawyers, as well. The San Beda Graduate School of Business offers three graduate programs specializing in the fields of business and management. These are Master of Business Administration (MBA), Master in Entrepreneurial Management (MEM) and Master of Business Administration-Organizational Development (MBA-OD), which were first offered in 2001. Graduate students grew from 44 in 2001 to about 250 during the AY 2005-2006. These graduate programs have produced 73 graduates since the initial offering. On its second year of program offerings in 2003, the Commission on Higher Education rated the San Beda Graduate School of Business as âvery goodâ and commended it for its relevant curriculum and degree offerings. Presently, the Doctor of Business Administration (DBA) Program has 20 students, 15 of which are Indonesians. Courses under these programs are guided by course syllabi designed following a competency-based curriculum. These courses are handled by 17 faculty members, six of which are DBA holders. These include academicians, practitioners, and entrepreneurs. The Graduate School of Law offers five graduate degree programs. Three of which are masteral offerings, namely: Master of Laws (Ll.M. )-regular program, Master of Laws (Ll.M. )-online program, and Master of Science in Criminal Justice Administration (M.Sc.J.A.). The Graduate School of Law also offers doctoral degree: Doctor of Juridical Sciences (S.J.D.). The system of academic lectures and teaching techniques combine classroom sessions held once a month and guided research. Extensive use in some subjects is made of on-line chat-sessions and in others, mentoring. Professors are invited from the senior members of the superior courts of the Philippines as well as from leading academics in law, criminology and related disciplines. In partnership with foreign students, the Dean and the Faculty may also craft individualized programs to suit the individual needs of foreign students. The faculty of the San Beda Law Graduate School includes prominent Filipino legal luminaries such as former Human Rights Commission Chairperson Purificacion Quisumbing, former Senator Rene Saguisag, former Supreme Court Justice Jose Vitug, former Associate Justice Ricardo Puno, and Justice Oscar Herrera, Justice Hilarion Aquino, currently Chair of the Legal Education Board of the Philippines, among others. Its dean is the well-known scholar and constitutionalist Fr. Ranhilio Callangan-Aquino. From the initial offering of the Master of Arts in Liturgy at the Paul VI Institute of Liturgy in Malaybalay, Bukidnon, the Graduate School of Liturgy (GSL) was formally established in San Beda College-Mendiola in 2002. The GSL offers the Master of Arts in Liturgy, Master of Arts in Liturgical Studies, and Doctorate in Liturgy. The GSL is believed to be the first and only liturgy school in Asia since it was founded in 2002. About 46 students are enrolled in the Graduate School of Liturgy (GSL). The GSL has several masteral graduates. One student has successfully defended the doctoral dissertation. The first doctoral graduate of San Beda College, according to the GSL, came from the liturgy school. Regular attendance of the faculty members in the National Meeting of Diocesan Directors of Liturgy, the Liturgy Week, and the Asian Liturgy Forum motivate them to do research on liturgical topics. Four GSL professors started to work on their doctorate since 2004. The GSLâs journal known as âScientia Liturgica,â and the trimestral newsletter, âLiturgy Updateâ serve as venues for faculty research and publication. The GSL is undertaking outreach projects which provide resource persons for formation seminars for liturgy personnel and clergy of the Archdiocese of San Fernando, Pampanga; summer program and short seminars at Paul VI Institute of Liturgy in Malaybalay, Bukidnon; Asian Liturgy Forum; and National Meeting of Diocesan Directors of Liturgy. The GSL faculty members mostly hail from local and international theological schools such as the Pontifical Liturgical Institute in Rome, the Maryhill School of Theology, Loyola School of Theology, UST Ecclesiastical Faculty, San Carlos Seminary, Mother of Good Counsel Seminary, to name a few. Among its prominent faculty members are Msgr. Moises Andrade, liturgist Rev. Fr. Genaro Diwa, GSL dean Dr. Josefina M. Manabat, SLD, and the world-renowned liturgical expert Very Rev. Fr. Anscar J. Chupungco, OSB who was one of the founding fathers of the Paul VI Institute of Liturgy in Malaybalay, Bukidnon, and the first dean of the San Beda Graduate School of Liturgy. Before becoming rector-president of San Beda College, Fr. Chupungco also served as the rector-magnificus of the Pontifical Ateneo of Sant Anselmo in Rome and was president of the Pontifical Liturgical Institute, also in Rome. Located in Alabang Hills Village in Muntinlupa City, San Beda College-Alabang (SBC-A) was founded in 1972 and was originally named Benedictine Abbey School. It began as a basic co-educational school. In 1995, it gained college status and renamed itself as St. Benedict College. In 2004, however, due to the clamor of the students and with the approval of the Very Rev. Fr. Anscar J. Chupungco, OSB, the college changed its name and has formally adopted since then the name, San Beda College-Alabang. The rector-president of San Beda College Alabang is Dom Clement Ma. H. Roque, OSB, who also served as former dean of the College of Arts and Sciences in San Beda College-Mendiola, Manila. The San Beda College of Law in Alabang was established in 2004. It serves residents of the southern part of Metro Manila who want to take up law but are not able to come to the Mendiola Campus because they live far away but they want to study law. The San Beda Alabang College of Law has been declared autonomous from the San Beda Law School in Mendiola, with Atty. Ulpiano P. Sarmiento III as its first and current dean. Among San Beda Alabang's prominent faculty members are former Senator Rene Saguisag, COMELEC Commissioner Rene Sarmiento and the famous lawyer brothers Sigfrid and Raymond Fortun, who both served as legal and defense counsels of former president Joseph Estrada during his impeachment trial in 2000. As part of its vision to become a leading school of arts in the Southern part of Metro Manila, the San Beda College Alabang established the Center for Performing Arts last 2007. The Center is offering short courses in theatre, drama, acting, dance, and music. The Philippine San Beda Male Singers is the alumni group of the San Beda College Chorale was the first Filipino choir to win the Olympic Champion award in the Young Male Category of the Choir Olympics held at Busan, South Korea in 2002. Moreover, the group was declared the national champion in the college choir category at the 2002 National Music Competitions for Young Artists (NAMCYA) held at the Cultural Center of the Philippines. To date, the group has embarked on five international tours in Europe and Asia since its present choirmaster, choral conductor and arranger Robert Delgado, assumed the post in 2003. They have travelled to various cities in Germany, Austria, Netherlands, Norway, Finland, Sweden, France, Spain and Italy, and key cities in South Korea and Taiwan. During its 2005 European and Taiwan tour, the group was the first Filipino choir to have stepped foot on the Russian territory of Estonia. The choir was the featured Filipino artist during the signing of cultural ties between Philippines and Estonia. Also, the group was the guest performer during the inauguration of the Philippine Consulate in Stuttgart, Germany. The choir also gave command performances for numerous Philippine Ambassadors and their counterparts in the different European countries. In the year 2006, the group, once again embarked its sixth international tour covering cities in Norway, Sweden, Denmark, Belgium, Germany, Spain and the United States. This tour featured a repertoire of âPhilippine Haranaâ, a selection of courtship songs. Also, the repertoire included secular and sacred songs of the different centuries, international folk and pop songs, Filipiniana folk, pop, and patriotic songs, and selected songs from the opera set in choral male medium. Lastly, with the help of the Filipino community in Baden Wuerttemberg in Germany, the funds generated from the performances in the area supported an orphanage in a small town in the Bicol province. San Beda College has a history of active and democratic student publications. This is attested to by the continuing existence of The Bedan, the official student publication of the College of Arts and Sciences, since 1941. The Bedan, although a CAS student paper, has a wide following within the Bedan community. It is especially revered by Bedans due to the fact that through the years, it has acted as the voice of the students and the guardian of their rights. There were many prominent Bedans who served either as editors or writers for The Bedan that include Alfonso Aguirre, Raul Roco, Rene Saguisag, Arturo Montesa, Alejo Villanueva, Ramon Medina, Oscar Contreras, and Ramon Mitra. The Spires is the official literary journal in San Beda. Previously, The Spires was a student research journal which dealt mostly with political, social, economic, philosophical, and theological issues until it suddenly ceased to exist. However, when The Bedan decided to revive in the 1990s, it was given a new form and new life; this time, as a literary magazine where Bedans can express themselves even in the most abstract literary manner. The editorial staff of The Spires is independent from that of The Bedan's editorial and managerial board. The Bedan Lamp is the College of Nursing's official student paper while for the College of Medicine, it is The Pulse. The Bedan Lamp has decided to open its doors to all Bedans from different tertiary departments. As for the College of Law, The Barrister is its official student publication, which is published quarterly. The Bedan Herald is the official student publication of the College of Arts and Sciences of San Beda Alabang. The Bedan Herald was previously known as The Benedictine Clarion, The Benedictine Rostra, and until recently The Benean. In San Beda College Rizal Campus, the High school department has the Cub Recorder. It is a magazine printed on glossy paper, with colorful layouts, graphics and texts. It is published thrice or four times every school year. The Grade School Department has The Little Bedan and Bedan Plus. San Beda College also has published research materials and scholarly journals published by its faculty and administrators. The College of Arts and Sciences publishes an annual scholarly journal called Scientia, which deals with topics such as economics, social sciences, history, public administration and management concepts. The College of Law releases an annual research material called The San Beda Law Journal. The articles in the San Beda Law Journal are written by both the students and the faculty of the San Beda Law School. The Graduate School of Business faculty articles are published in the Graduate School of Business Journal. The Graduate School of Liturgy produces the Scientia Liturgica, a journal which is dedicated to the advancement of liturgical studies in the Philippines and in Asia. The Graduate School of Law publishes the well-respected San Beda Graduate School of Law Journal of Graduate Research. Named after the Venerable Bede of England, San Beda College was established by Spanish Benedictine monk Fr. Juan Sabater, OSB in Manila during the onset of the American colonial era. Prior to this, there were thirteen Benedictine monks from the Abbey of Our Lady of Montserrat in Spain who arrived in the Philippines in 1895. Their intent was to do mission work in Surigao. However, as Americans slowly but successfully began to colonize the Islands, the Benedictine monks, fearing the spread of Protestantism, began to contemplate the idea of establishing a school dedicated to propagate and defend the Catholic faith. This vision was realized in 1901, when the monks already transferred to Manila and founded the El Colegio de San Beda. During the inauguration of San Beda on June 17, 1901, Fr. Silvestre Jofre, OSB said in his homily that, âThe College of San Beda comes to the arena with the sole purpose of helping to defend the Catholic battlements in the field of education.â With that, the school opened exclusively for young boys with 212 students taking primaria enseÃ±anza and secundaria enseÃ±anza, the equivalent respectively of grade school and high school with the first two years of college. El Colegio de San Beda was located in Arlegui Street. In 1906, the Royal, Pontifical and Catholic University of Santo Tomas, as the leading Catholic institution in the Philippines, recognized and assisted the then-relatively young San Beda College in its course offerings. Also in 1906, the College became an affiliate to the Royal, Pontifical and Catholic University of Santo Tomas. In 1910, however, the school revised its whole academic curriculum, as a result of the requirements set by a new law in order for schools to be recognized by the government. San Beda was now an independent private college with the authority to grant the Bachelor of Arts degree, and elementary and high school diplomas. It also began to abandon Spanish as its language of instruction and started to teach not only the English language but American history and politics, as well. In 1916, Dom Jesus Y. Mercado designed the first college seal. In 1918, as a result of the growing American influence, the college decided to drop its old name, El Colegio de San Beda and began calling itself, San Beda College. In 1926, the Benedictine monks moved the school in Mendiola Street, where it still stands. The reason for the transfer was that a bigger campus was needed to cope with demand. By 1927, the courses offered by San Beda expanded. It included grade school and high school, the two year courses of pre-medicine and pre-law and the first two years of commerce. During that year also, Bedan athletes won their first crown in the National Collegiate Athletics Association (NCAA) league. From 1940 to 1947, the Abbey of Our Lady of Montserrat in Manila was under the apostolic administration of Abbot Alcuin Deutsch, OSB of St. Johnâs Abbey, Collegeville, Minnesota. Three monks were sent to Manila to administer the Abbey and San Beda College. The College welcomed the only American rector in its history, Fr. Boniface Joseph Axtmann, OSB. It was also in 1940 when the school began to carry the Red Lion as the emblem. When World War II broke out, San Beda College was used by the Japanese Imperial Army a concentration camp. During these years, classes were held quietly in the Abbey of Our Lady of Montserrat, although such classes were only limited. After the liberation by joint Filipino and American troops, San Beda briefly functioned as an American army hospital for Japanese resistance fighters. After the War, the school began to expand. After Fr. Sud Ballecer's liberal democratic style of running the College ended in 1947, a similar kind of leadership emerged under the administration of the Spanish Benedictine monk, Fr. Sergio Martinez, OSB. It was during his term that he decided not only to offer programs in the fields of arts and sciences but also in jurisprudence. In 1948, Fr. Martinez formally established the San Beda College of Law. From 1953-1958, the San Beda Law School earned the distinction of producing a 100% passing record during the Bar examinations. San Beda College also became one of the founding schools of the Catholic Educational Association of the Philippines. Eventually, San Beda College became a chartered school of the Philippine Accrediting Association of Schools, Colleges and Universities in 1957. Then Rector Fr. Benigno Benabarre, OSB was responsible for the schoolâs inclusion to the PAASCU. Fr. Benabarre also set up an alumni network of Bedans, which would eventually become the San Beda College Alumni Association. On June 17, 2001, San Beda College celebrated its centennial. During the opening ceremonies for its pre-centennial in 2000, former president Corazon Aquino, Bedan alumni senators Raul Roco and Rene Saguisag and then rector-president Bernardo Ma. Perez, OSB graced the event. In that same year, a new administration under Fr. Anscar J. Chupungco, OSB emerged. That same year, San Beda College offered the Graduate Program in Business which was granted full autonomy and rated "very good" by the Commission on Higher Education. On June 17, 2002, the San Beda College of Medicine and the Graduate Program in Liturgy were inaugurated, heralding the schoolâs expansion program in health sciences. The following year, the College of Nursing and the Graduate School of Law were also established. To give a more conducive academic environment to grade school and high school students, the San Beda College-Rizal campus was formally opened in June 2004. That same year, St. Benedict's College was formally renamed San Beda College Alabang. San Beda represented the Philippines in a five-country research collaboration in the ASEAN region. On February 10, 2009, Fr. De Jesus, representing San Beda College, signed an agreement with the Presidents of Institut Teknologi Bandung, Indonesia; Universitas Kelantan, Malaysia; Ho Chi Minh Business University, Vietnam; and University of St. Galen, Switzerland (in collaboration with Singapore), establishing the ASEAN Network for Inter-Cultural Management and Economic Studies (ANIMES). The Research Network will provide faculty members of San Beda College an international window for their research outputs as well as joint research activities with peers from the other ASEAN countries. Since its construction in Mendiola street, all buildings of San Beda College adapted the Neo-Gothic style of architecture. However, renovations have been made in some areas such as the tiles and gates. New structures were constructed such as the covered walk and pavilion near the entrance gate. In July 2009, San Beda College announced in their official school publication, The Bedan today that the school had applied for university status. The college hopes that by year 2013, it would be granted university status. San Beda has been taking preparatory steps for university status since 2002. It has already opened a College of Medicine, College of Nursing, Graduate studies, and making San Beda a co-educational institution from an exclusive school for boys. Other plans include transferring the College of Law to Fort Bonifacio and establishing more new colleges and courses such as the College of Accountancy and College of Engineering. San Beda College adopted the Red Lion emblem from the ancient Scottish/English heraldic symbol, the Red Lion Rampant. The school, named after the Venerable Bede of England, naturally chose the heraldic symbol of the ancient Scots/English for courage. It has been said that the Judeo-Christian roots of the Anglo-Saxon world was preserved by the Benedictines during the Dark Ages through faith and courage. Pope Benedict XVI himself openly declared that the Benedictines saved Europe's Christian roots. San Beda pays tribute to the courage of the Benedictine monks by adopting the Red Lion, the symbol of courage in the Catholic tradition and in the land of St. Bede. It has to be noted that the Benedictines are a key part of the history of Great Britain itself. Before the beginning of the 1960s, Bedans were singing a different school hymn. In 1966, Senator Raul Roco, then a San Beda law student, wrote a new alma mater hymn which would capture the Bedan spirit. After finishing the lyrics, Roco then gave the lyrics to Rev. Fr. Benildus Ma. Maramba, OSB for its melody. It took Fr. Maramba, two days to finish the song composition. It is sung at important events such as the NCAA basketball season, the Bar exams, and alumni gatherings but also at simple affairs such as seminars and small get-together of Bedans. The practice of adopting a school moniker became both fashionable and an imperative especially for Catholic school named after Saints during the 1940s in the Philippines. The American Catholic schools started the rage earlier when the clergy became wary of sports headlines such as â St. Peter mauls St. Paul 80Â â" 40â. In the Philippines, headlines of whipping and trashing of schools named after saints drew mixed emotions among the clergy and devout Catholics. âWhy would a Catholic saint whip another Catholic saint?â, they would ask. On July 31, 1940, Fr. Sergio Martinez OSB, inspired by English tradition, coined the moniker âRed Lionâ for the school. Red is the color of courage, of a warrior and a martyr. The lion, on the other hand, represents dominance as the king of the jungle. The Cuerba brothers, both Bedans, composed the Indian Yell in 1947 after the liberation from the Japanese empire. The Indian Yell was initially solely performed on drums accompanied by cheers from the students. However, this made the cheer somewhat lacking in power and needed something to rejuvenate the audience. So they changed the sound of the yell and incorporated a horn section. Accompanied by the tomahawk chop, the Indian Yell became more lively, intimidating, and full of spirit. The Indian Yell is San Beda's romanticized version of the Indian war whoop. It mimics the native Indian war chants and vocalization techniques designed to intimidate the opponent. North American Indian war chants are verbalization of tunes that implore the great spirits to help them in battle. The romanticized Bedan Indian Yell is believed to have been inspired by the Plains Indian. The Indian war whoop also gave rise to various derivative chants most especially the Lion's Roar. The Lionâs roar, with the simple "Wooohooo", also mimics primitive chants of Native American Indians. This is an indirect offspring of the Wahoos started by both Dartmouth College and the University of Virginia in the 1890s. Bedans popularized this aboriginal Native American form of chanting in the Philippine collegiate league and has spawned variations now used by many other schools. To accompany the Indian Yell, the Little Indians were conceptualized by Ramon Ventoza (GS '46, HS '51). Mon Ventosa is the longest serving moderator / instructor of the San Beda College Cheering Association. A cheerleader himself during his student days in San Beda College, Mon was appointed as instructor of the College's Cheering Squad (1952â"1962). He came up with idea to counter the gaining popularity of the dance number of Jose Rizal College. There were only three Indians in 1947: Gabriel Gasar and the Casal brothers, one of which eventually became a Benedictine monk. Slowly, the recruitment process changed and participation from the grade school pupils rose because many wanted to become Little Indians. Tito Mon wanted the Indians to be stout and adorable. From three Indians since 1947, the membership rose to a minimum of eight in the 90s. One of the more popular line in the traditional Bedan cheers is "Animo San Beda". Bedans use Animo to mean courage in their cheers. When Bedans yell âAnimo San Beda!â they actually mean âCourage San Beda!/Have Courage San Beda! ", faithful to the Spanish idiomatic usage of the word. Animo is a Spanish word which means spirit, energy, vitality, purpose and will. Used as an expression of encouragement by Spanish speaking societies, it means courage or have courage. "Avance San Beda!" and "Vamos!" were also popular then. In the pre-war Spanish San Beda cheer (also known as El Colegio de San Beda Tiene que Ganar! ), "Animo" is also included. There have been twenty-two rector-presidents of San Beda College, including the newly appointed Rev. Fr. Aloysius Maranan, O.S.B., since its establishment in 1901. From 1901 up to the 1970s, most rectors were of Spanish descent. Fr. Silvestre Jofre, OSB was the first Benedictine monk to become rector-president of the then El Colegio de San Beda. Meanwhile, with the advent of American colonization of the Philippines, Fr. Boniface Axtman, OSB became San Beda College's first and only American rector-president in 1941. As rector-president of San Beda, Fr. Axtman is remembered and credited for his liberal and democratic style of leadership and for bringing back stability, progress, and order in San Beda, which had been devastated by the onslaught of World War II. Also, during his tenure, Fr. Axtman strongly encourage student empowerment and campus press freedom. In 1948, under the helm of Fr. Sergio Martinez, OSB, the new rector-president of the college, San Beda finally opened its College of Law, which also accepted female students and applicants. During this period, San Beda also expanded its educational programs by offering courses and degrees in commerce, marketing and business, for which it became renowned for. During the 1970s, Rev. Fr. Bernardo Ma. Perez, OSB, a well-known architect and art critic, became the first Filipino rector-president of San Beda College in 1971. He also holds the distinction of being the longest-serving rector-president of the Benedictine college, from 1971â"1974, 1977â"1983 and from 1985 to 2001. All in all, Fr. Perez served as rector-president of San Beda for a total of 25 years. Fr. Perez is also reported to be a classmate and batchmate of the slain national hero, Benigno Aquino, Jr..
After 25 years of Fr. Perez' rectorship of the college, San Beda had a new rector-president in 2001 in the person of the Rev. Fr. Anscar J. Chupungco, OSB. Before becoming rector of San Beda, Fr. Chupungco spent more than twenty-five years in Rome, where he did not only teach liturgy and theology but also gained international prominence as an international liturgical expert. During his time in Rome, Fr. Chupungco served as president of the Pontifical Liturgical Institute. At the same time, he also served as rector-magnificus of the Pontifical Atheneum of Saint Anselm (Pontifical Ateneo of Sant'Anselmo in Italian), also in Rome, Italy. Due to his intellect and expertise on liturgical and theological matters, Fr. Chupungco was appointed a consultor to the Vatican's Congregation for the Divine Worship and the Congregation for Catholic Education. Given this vast experience he gained through the years both as an academician and as a liturgical expert, Fr. Chupungco instituted many academic reforms in San Beda College during his six-year reign, such as the establishment of the San Beda Graduate Schools, namely, the Graduate School of Law, the Graduate School of Business, the Graduate School of Liturgy and the now-defunct Graduate School of Philosophy. In particular, the San Beda Graduate Schools did not merely offer graduate degrees but also opened up new courses and innovative graduate programs such as the Doctoral and Masteral programs in Liturgy (the first of its kind to be introduced in the Philippines) and the Master of Philosophy and Good Governance, which was later on discontinued in the succeeding school administration. He also sought to revitalize the research program of the school by establishing the Research and Planning Development Center (RPDC). More so, under his watch, San Beda expanded its educational program from liberal arts, law and businesses to the natural sciences by setting up the College of Medicine and the College of Nursing. He also started forging global academic linkages and ties between San Beda and several foreign colleges and universities. Also, during his tenure, Fr. Chupungco finally opened wide the doors of the College to female students. Previously, with the exception of its College of Law, San Beda College has been the last exclusive college for boys in the Philippines. Further, as a result and fruit of all the hardwork and efforts of Fr. Chupungco's administration, San Beda was consistently given a Level III Accreditation by PAASCU and was granted an autonomous status by the Commission on Higher Education, which served as a recognition of San Beda's academic excellence and competence. Also, during his time, San Beda partnered with the Asian Development Bank in putting up a San Beda-ADB Knowledge Center in the campus. Furthermore, because of these achievements and reforms made under Fr. Chupungco's watch, San Beda College has since then embarked on an academic goal of eventually becoming a full-fledged university in the near future. As the twentieth rector-president of the college, Fr. Chupungco is fondly remembered by the Bedan community for laying down the foundations to make San Beda a university in the near future. Fr. Chupungco is also the first and only rector to become rector-president of the three San Beda campuses: San Beda College-Manila, San Beda College Alabang and San Beda College-Rizal, from 2001 to 2008. He is also one of the College's most-beloved rector-president. Meanwhile, the twenty-first rector-president, Rev. Fr. Mateo Ma. J. De Jesus, OSB, the first doctoral graduate of the University of the Incarnate Word, San Antonio, Texas, USA to become head of an educational institution in the world, focused on upgrading and beautifying the facilities of the college, improving its student services program and strengthening and expanding both the local and international academic linkages of San Beda. During this period, San Beda entered into several memoranda of agreements with foreign educational institutions on faculty and student exchange programs such as the University of the Incarnate Word, San Antonio, Texas, Universitas Persada Indonesia Y.A.I., Institut Teknologi Bandung (ITB), Indonesia, Universitas Widyatama, Bandung, Indonesia, and the National Taitung Junior College, Taiwan. He served as rector-president from 2007â"2010. At present, the rector-president of San Beda College is Rev. Fr. Aloysius A. Maranan, OSB, who prior to becoming a priest obtained his Bachelor of Arts in Economics from San Beda in 1976. Apart from his economics degree, Fr. Maranan is also a canon lawyer of the Catholic Church. As rector-president, he sought to improve the school administration's relations and services to the students, such as revitalizing The Bedan Student Publication and engaging with the San Beda Student Council. Also, during his first term, Fr. Maranan promised to revitalize the liberal arts program of San Beda and enhance its educational and academic programs. In May 2013, Fr. Maranan was unanimously re-elected by the Board of Trustees of San Beda College to serve a second term as rector-president for three more years. As one of the reputable educational institutions in the Philippines, San Beda College counts among its illustrious roster of students, alumni and graduates numerous national leaders and pioneers in politics, business, law, athletics and entertainment such as former senator and democracy martyr Benigno S. Aquino Jr., former senator Raul S. Roco, former Speaker Ramon V. Mitra, former senator and human rights icon Rene Saguisag, former Supreme Court Chief Justice Roberto Concepcion, Associate Justice Florenz Regalado, business tycoon Dr. Manuel V. Pangilinan, real estate and property magnate Ambassador Eduardo Antonino B. Antonio, business tycoon, billionaire and entrepreneur Robet Coyiuto, Philippine basketball legend Carlos Loyzaga, actor Eddie Gutierrez, and 2004 Philippine presidential candidate and the King of Philippine movies, Fernando Poe, Jr.
Romeo J. Callejo Sr.(Ll. B)Â â" Former Associate Justice of the Supreme Court of the Philippines. Justo P. Torres, Jr. (Ll.B)Â â" Retired Justice of the Philippine Supreme Court. Don Eugenio "Geny" Lopez, Jr. (GS)Â â" Founding Chairman, ABS-CBN Network, Inc.
Ricardo Z. Cuna (GS, HS, BSC) - President and Founder, Fiorgelato, Inc.
Manuel P. Maramba, OSB (AB)Â â" Church musician, canon lawyer, musician for Pope John Paul II's 1995 Papal Visit to the Philippines and composer of The Bedan Hymn. Jimmy Antiporda (GS, HS)Â â" composer, music arranger and record producer. Ramon L. PinedaÂ â" Member 1967â"68 NCAA Junior Champions,competed 1974 Cesta-Punta Mundial, Montevideo, Uruguay. Professional Jai-Alai Player 1975 to 1983. Tom ConconÂ â" Former Junior Golf World Champion 13â"14 years old Division. Pia Cayetano (GS, HS)Â â" Philippine Senator. Lino Cayetano (GS, HS)Â â" Television Director and brother of Senator Pia S. Cayetano. Jon Santos (GS, HS)Â â" TV Host and Actor. Christopher "Top" Suzara (GS, HS)Â â" Freestyle Band Guitarist and more recently, Solo Performer. Ito Rapadas (HS)Â â" vocalist of Neocolours and head producer of Universal Records. Washington Bedans San Beda Alumni Association in Washington, D.C.